Whilst Kevin Hart has taken up most of my cinema viewing over the past few weeks with Ride Along and About Last Night, it appears as though Kate Winslet is following suit with a double bill of releases in late March and early April. The first of these releases is Labor Day, an adaptation of the 2009 novel of the same name by Joyce Maynard that tells the story of a mother and her teenage son who become irreversibly involved with an escaped convict over the course of a holiday weekend in 1987. The film’s trailer proposed a gritty, engaging drama with the hint of inevitable romance, but the vague manner in which the narrative was alluded to in the two minute teaser lead me to believe that the filmmakers were trying to hide something. And it became increasingly clear as the plot unfolded that Labor Day is nothing more than a slightly elevated version of any Nicholas Sparks novel one can think of. Winslet stars as Adele, a fragile and depressed mother, still reeling from a divorce and almost entirely dependent on her thirteen year old son Henry (Gattlin Griffith) for support. On one of their stress filled and infrequent trips to the supermarket, the pair are accosted by a gruff injured man who has escaped from prison named Frank (Josh Brolin), and he coerces them in to driving him to their home and allowing him to rest before he makes a run for freedom. In what feels like breakneck speed, Frank has assured the family that he means no harm, has set about fixing all the broken parts of Adele’s home, has taught Henry how to bake in one of the most bizarre sequences of the film, has taught him how to throw a baseball, and has succeeded in stealing Adele’s heart. With the threat of the police bearing down on them, one can understand the pace at which the narrative progresses, but what is unforgivable is the contrived, cliched dialogue that accompanies the romantic element of the picture. Phrases like “I would risk another twenty five years just to have three more days with you” are completely common and uttered without any sense of irony, and it is this lack of any humour that turns the film in to a cheese-fest of, at times, almost unbearable proportions. This Nicholas Sparks-esque aspect of the film is undoubtedly what the filmmakers were attempting to dampen in the trailer, as I was certainly not expecting a corny romance, but rather a tense, suspenseful drama. Admittedly, there is an engaging thread of drama throughout the film that keeps the audience interested and on the edge of their seats at certain points, but this grittier edge is constantly undermined by the hammy, groan worthy romantic dialogue that is so heavy handed in comparison to the more subtle, dramatic themes. Notice how, despite my adamant dislike of the romantic schmaltz in this and in similar pictures like The Notebook or The Lucky One, I have described Labor Day as a slightly elevated version of such films, this is solely down to the strong performances from the central cast. Kate Winslet manages to fight against her cliched lines and turn in an excellent performance as the brittle Adele. With just the tilt of her head or the tremble of a hand, Winslet brilliantly conveys the fragility of the character, and her convincing and evident need for love makes the speed at which the plot progresses much more palatable for the audience. Josh Brolin as Frank is similarly impressive and successful in making the most of his cringe worthy dialogue, emphasising much of his character through physical presence and the chemistry between the two actors, though hurried, is believable and makes for satisfying viewing. Gattlin Griffith as Henry gives a fine performance for a young actor who has to deal with a messy subplot concerning his own sexual awakening that, though obviously prevalent in the novel, is wedged without major purpose in to the film that clearly favours the adult relationship as its central focus. This is also problematic in terms of the fact that an older version of Henry (voiced by Tobey Maguire) narrates the film, and whilst this is clearly a nod to the structure of the novel, the choice to keep this narrative technique but abandon the core of Henry’s personal story and development leaves the film without a clear voice. The book is marketed as a coming-of-age tale, but the film is clearly aiming for an older, romance fuelled demographic. Overall, Labor Day is a film that shows the promise of engaging drama and meaningful content, but is overwhelmed and therefore undermined by its heavy handed and cheesy approach to the romantic content of the narrative. After the heady months of Oscar season, the film feels very, very light in terms of real quality, but it is at least something a little different to the super heroes and frat boy comedies that plague the cinemas at this time of year. 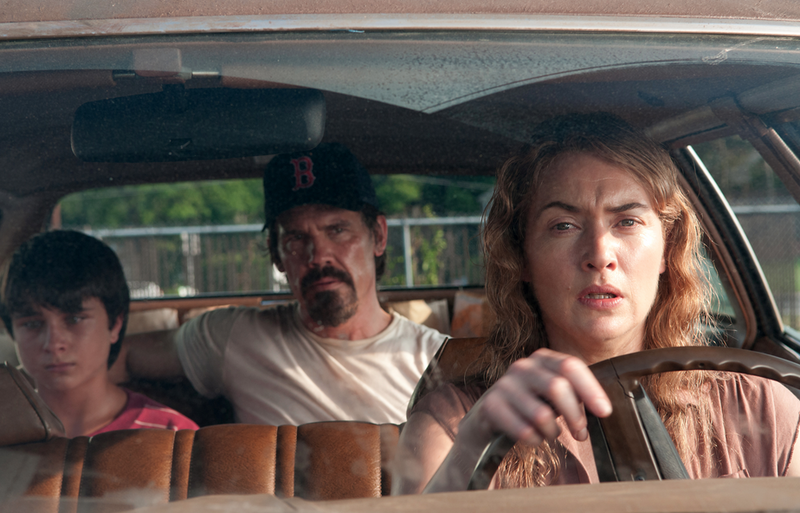 Kate Winslet continues to be captivating in everything that she does, but despite even her best efforts, she cannot save Labor Day from being a picture that ultimately drowns in its own sentimentality. I hate it when Kate Winslet does these sappy romances… I thought “Revolutionary Road” was terrible, so I can’t imagine how cringe-worthy this must be. It really speaks to her talent as an actress that I still admire her despite all the sappy stuff she’s done! Labor Day is one of those films I thought I would hate because the cliche romance aspect, like you mentioned in your review. But, I was shocked at just how much I enjoyed it. I’ll admit, I got a little emotional at the end. This is coming from someone who stays far away from any thing related to Nicholas Sparks. I felt that the performances were solid and the story was interesting. It’s not a great movie, but it did surprise me.